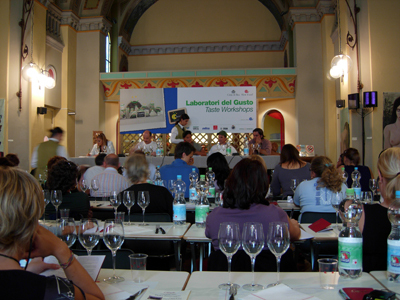 Workshop to discover the sweet side of cheese. Cascioni (or piconi) from the Marche, cannoli from Sicily, torta di ricotta and pears and torta tramontina baked by the pastry chefs at De Riso in Minori (Salerno) and candied ricotta from Rizzati in Ferrara served with sweet wines: Champagne Fleury Blanc de Blancs doux millésimé, Moscato di Pantelleria Turbé di Salvatore Murana and Melizie di Mastroberardino. 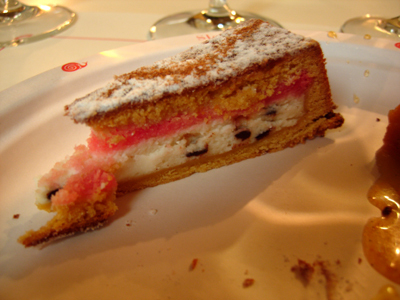 One late change to the program - the Cascioni was replaced by a special Baked Cassata. The first tasting plate - they certainly are generous with their servings. 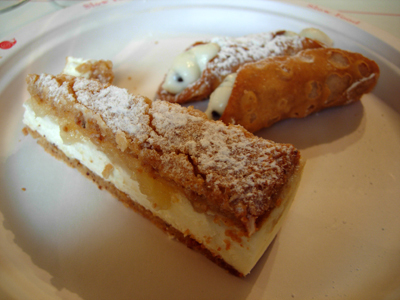 We got an added bonus of the Chef's recipe to make the cannoli shells. They did taste quite a bit differently to those I've had in Australia - the ricotta had a bit of a tang but was quite well whipped. The flavourings were kept very simple - some candied fruit and chocolate chips. Sheeps' ricotta is used, sugar is added then it is left to rest for 1 hour. Next it is sieved before the flavourings are added. 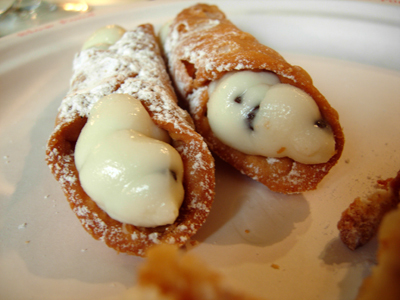 Historically, cannoli were never made in july and august due to the high temperatures. With the introduction of a cold supply chain, milk is now frozen the rest of the year and used to cover these two months. 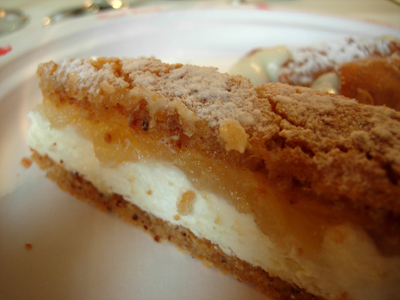 Torta di Ricotta and Pears: The other sweet is a whipped ricotta and pear tart that sits between a nutty pastry crust. The pears had been soaked in a little liqueur and cows' milk ricotta was used. 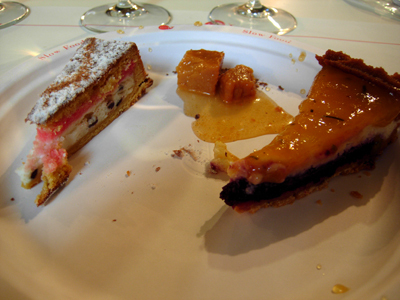 The first wine match was a typical pairing - using the sweet/sweet flavour harmony. 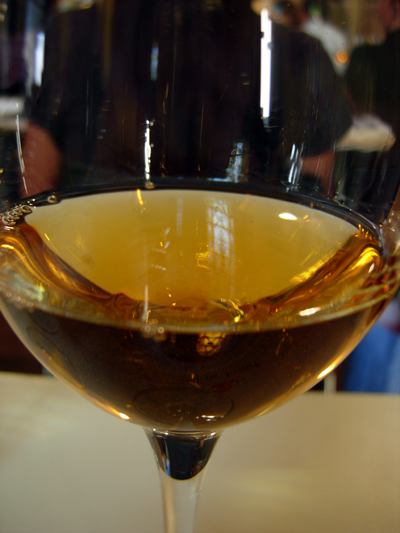 This wine is known as a sweet champagne or Doux. It is 100% chardonnay. The second plate of sweets - I told you they were generous! 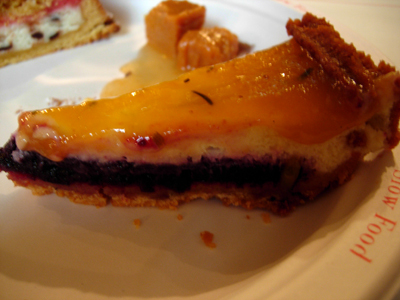 Tramontina Tart - it is made to resemble the sunset colours. The bottom layer is pastry, topped with a cherry filling, then ricotta and finally a puree of apricots. Baked Cassata - this is made using lard pastry. The pastry surrounds the layers of ricotta and liqueur soaked sponge cake. It is then baked and served as shown. 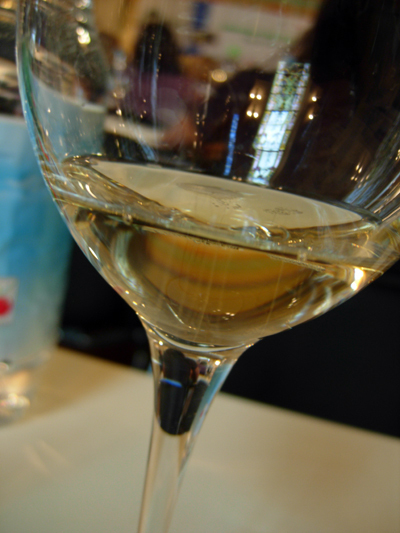 Our second wine is wood fermented and made for fiano grapes. There's candied fruit and vanilla as well as acetone notes in the nose. Candied Ricotta - the ricotta is initially candied for 3 days, then it is cut into cubes before receiving the final canding process. It is then stored in jars and pasteurised which gives it a long life. It was served with some smoked chocolate - chocolate was smoked at 40°C in a mix of juniper and cinnamon smoke. It was interesting to hear how candied fruit has really fallen out of favour due to the inferior mass-produced product so much so that people don't want candied fruit in their pannetone. This producers is an artisan producer and to make candied oranges it takes 13 days! Next time if you baulk at the price remember how long it has taken and if you taste the real thing rather than the manufactured then it is worth the price. I should add the taste of candied ricotta is very much like chewy caramel, you just wouldn't pick it at all. 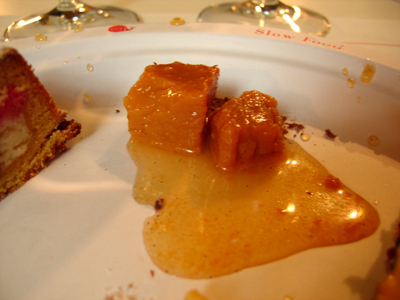 The final wine was paired solely with the candied Ricotta. 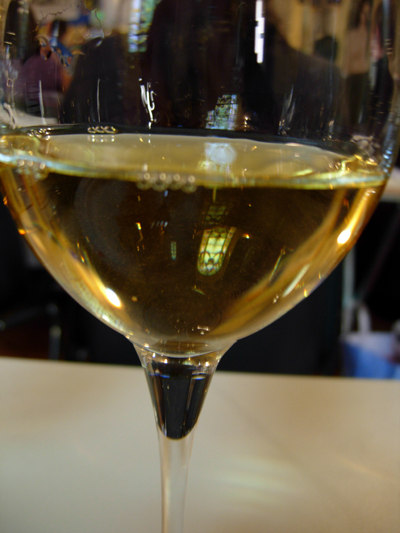 The Moscato is stell fermented and slightly fortified and although it is a Moscato it uses a different variety of grapes as the Asti Moscati.